ADD your ISIN Codes to ISIN.org Public Database for All to View. Add your ISINs to our database and we can submit, for no cost, your profile to outside third parties, i.e. portals like Bloomberg and Morningstar. Note: ISIN.org is independent of banks, governments, associations, and financial institutions such as Mornginstar, Bloomberg and others and ISIN.org has no affiliation with any such party. The ISIN Organization (ISIN.org) is the largest independent source of International Securities Identification Number information and the most robust and most easily-accessed ISIN database in the world. ISIN.ORG is the top rated web address for ISIN code information searches worldwide. Every internet search for ISIN codes or related Securities Issuer information leads immediately to www.isin.org. ISIN.org maintains two databases: (i) a private database for ISIN.org Members to search and sort the millions of ISIN codes issued across 120 regions in the world, and (ii) a free, public database that enables anyone in the world to LOCATE and VERIFY a security by Issuer name. In today’s global financial marketplace, qualified private and institutional investors demand transparency and “information integrity” with regard to investment vehicles offered by Issuers of securities. If your investors cannot verify that a security has been properly issued in accordance with global financial market protocols, they may be prohibited from investing in your Offering. ISIN.org fills this void. 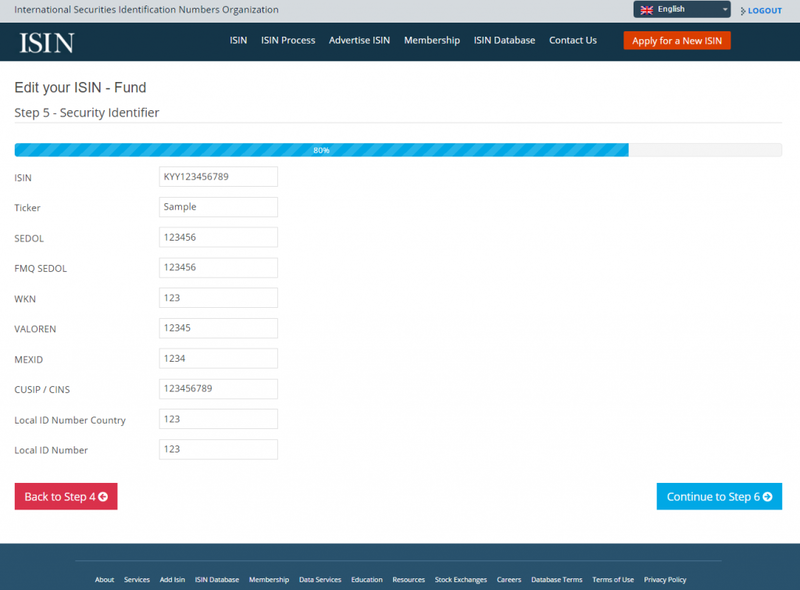 Listing your ISIN code or fund performance on the ISIN Organization’s public database and receive great exposure for your fund. ISIN.org is the top rated destination for ISIN number searches worldwide. By creating your own account with ISIN.org you can login and update your information as often as you like, including your Net Asset Value or Nominal Value. Updates are in real time. FOR A SAMPLE VIEWING PLEASE CLICK ANY BUTTON BELOW. There a few, if any, reputable public platforms for funds and companies to publicize their private issues and ISIN codes. Issuers of securities, including public and non-public companies, municipal governments, private equity firms, and the thousands of hedge funds, mutual funds, unit trusts and others that that issue debt, equity, warrants, private placements and financial derivatives, have few credible and easily-accessed platforms to publicize their ISINs. In addition, not only is there little to no ability to publicize their ISINs, they cannot publicize their private securities, including current values, corporate action notices and other relevant data the Issuer wants to publicize. ISIN.org’s database fills this void. Other than ISIN Organization’s Global Database, information repositories of financial securities data are closed ‘terminal farms’. These data farms are typically subscribed to by investment banks and management firms and are charged on a per user basis for tens of thousands of dollars per annum. Even then, those financial data platforms do not maintain Issuer or ISIN code information pertaining to the millions of private securities placed with investors across the 120 global regions in which ISIN codes are issued. ISIN.org’s database fills this void. ISIN Organization’s robust ISIN database allows for issuers to publicize their ISINs. The majority of ISIN codes that are issued are private securities; thus the ISIN(s) remains private, unless placed on a platform such as ISIN Organization’s database.